The Adventures of Maui Don - Dolphin Dude: Yeow! I almost pooped my pants three times this morning. 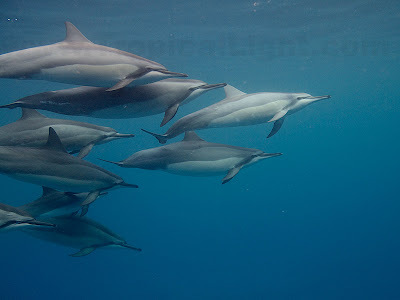 This group of eleven Spinner Dolphins sneaked up on me during my ocean swim. Twice. I was minding my own business (looking for whales, actually) when I was suddenly surrounded by this pod of dolphins. Yeow! I didn't quite walk on water, but it was close. 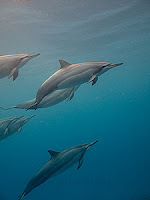 I floated in place while they circled me, then continued back toward shore when they left. Eeek! Unexpectedly, there they were again. 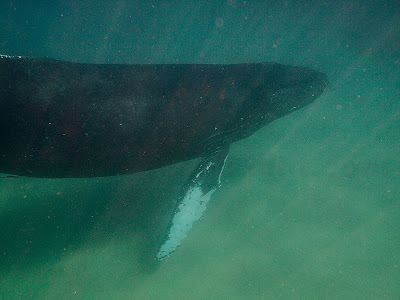 Then, when I was almost to the beach, a Humpback Whale appeared under me. Right under me. Close under me. Yeow again! It was so unexpected and moving so fast that I didn't even notice the baby whale above it until they were both gone. Wow! What a morning.